Keeping Missouri in the Union was one of the prime objectives of the Federal government during the first year of the Civil War. 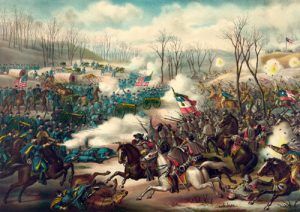 It was the reason for the Battle of Wilson’s Creek near Springfield, Missouri in August of 1861, and it was one of the reasons for the Battle of Pea Ridge, Arkansas in March 1862. The Pea Ridge Campaign began Christmas Day 1861 when General Samuel R. Curtis was appointed to command the Federal Southwestern District of Missouri. His main objective was to drive out the Confederates, and by mid-February, 1862 his troops had chased Major General Sterling Price and the pro-Confederate Missouri State Guard into Arkansas. In the Boston Mountains south of Fayetteville, Price joined forces with Brigadier General Ben McCulloch, and on March 4th, this combined 16,000 man army marched north under the command of Major General Earl Van Dorn. Their mission was to force their way back into Missouri and capture St. Louis, but Curtis’ 10,500 Federals were waiting on the bluffs above Little Sugar Creek, not far from Elkhorn Mountain, part of the larger Pea Ridge plateau. Van Dorn knew that a frontal assault would be disastrous, so he swung north to come in from behind. Planning to strike at dawn on March 7th, his troops were hungry, cold and weary from a difficult three-day march, and arrived hours behind schedule. McCulloch’s Confederates fell so far behind that Van Dorn decided to divide his army temporarily, ordering McCulloch around the west end of Elkhorn Mountain, then east along Ford Road to rejoin Price’s troops near Elkhorn Tavern. This gave Curtis time to turn his line around and prepare for the attack from behind. As McCulloch’s troops, including two regiments of Cherokee Indians, were engaged in this maneuver, they ran into an intensive fire near Leetown, which led to the killing of McCulloch and Brigadier General James McIntosh, and the capture of the ranking colonel. With the lack of command structure, McCulloch’s men scattered from the field. Attacking east of Elkhorn Mountain, Van Dorn and Price fared better. Price’s troops slowly and steadily pushed the Federals back until, at nightfall, they held Elkhorn Tavern and the crucial Telegraph and Huntsville Roads. During the night, survivors of McCulloch’s Leetown fight joined them. On the morning of March 8th, General Curtis led his men in a counterattack of the tavern area. A two-hour artillery barrage crippled the Confederate line, and a Union infantry attack broke their defenses. Realizing his ammunition was running low, Van Dorn ordered his troops to withdraw and The Battle of Pea Ridge was over. Afterwards, most of the Union and Confederate troops moved east of the Mississippi to fight in other campaigns. Missouri remained in the Union and politically neutral throughout the war, although it provided men and supplies to both sides. Today, the Pea Ridge National Military Park commemorates and preserves one of the most pivotal Civil War battles in its 4,300-acre park. 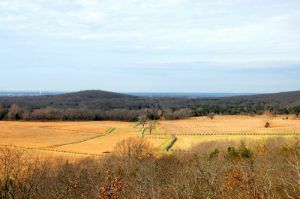 The most intact Civil War battlefield in the country, the park encompasses the entire battlefield as well as a section of original earthworks constructed prior to the battle by the Federal forces. 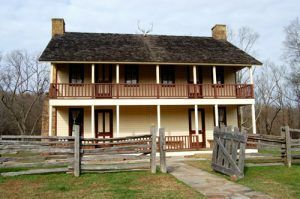 Major features include a recreation of the historic Elkhorn Tavern structure, original remnants of the Telegraph-Military Road, an important thoroughfare prior to the war; as well as the battlefield itself. 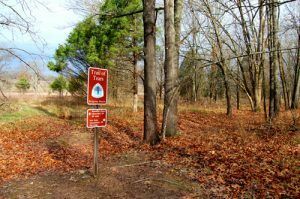 The park also preserves one of the only “intact” sections of the Trail of Tears, in which more than 15,000 Cherokee Indians were forced to give up their lands east of the Mississippi River and migrate to Indian Territory in 1838. Their historic trek left behind a permanent indention in the ground where the thousands walked through this forested land. The park, created by an Act of Congress in 1956 and dedicated in 1963, is administered by the National Park Service, Department of the Interior and is part of the Civil War Discovery Trail, the Lower Missouri Civil War Heritage Trail and the Trail of Tears National Historic Trail. Compiled and edited by David Alexander/Legends of America, updated December 2017.